Easter is over and baskets with half eaten chocolate bunnies and cracked open plastic eggs adorn your child’s room. You are still finding pieces of plastic green grass stuck to your sock as you walk around the house. Spring is getting closer, but is not quite here. So, what can you do to make this week a little more eggciting? This is a great way to reuse Easter eggs, especially for the eggs that one side is broken. This cute guy would make a great “bookworm” or snake to play with. carefully poke a hole in the center of each half of the older plastic eggs. Try using a thumb tack to make holes. 1. Measure and cut a cord about 30-36 inches long. you are using the newer eggs with pre-made holes. 5. When your cord is full, knot the cord on the end to hold the egg shells together. 6. 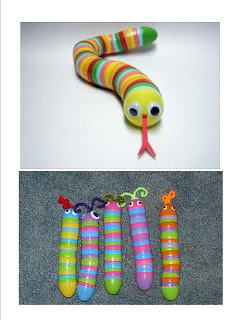 Decorate the worm/snake’s head using the bottom of one of the eggs. 8. Make a tongue or smile. 9. Snap the bottom onto the last shell top. Insert a flameless LED tea light into on end of a plastic Easter egg. No glue is needed. 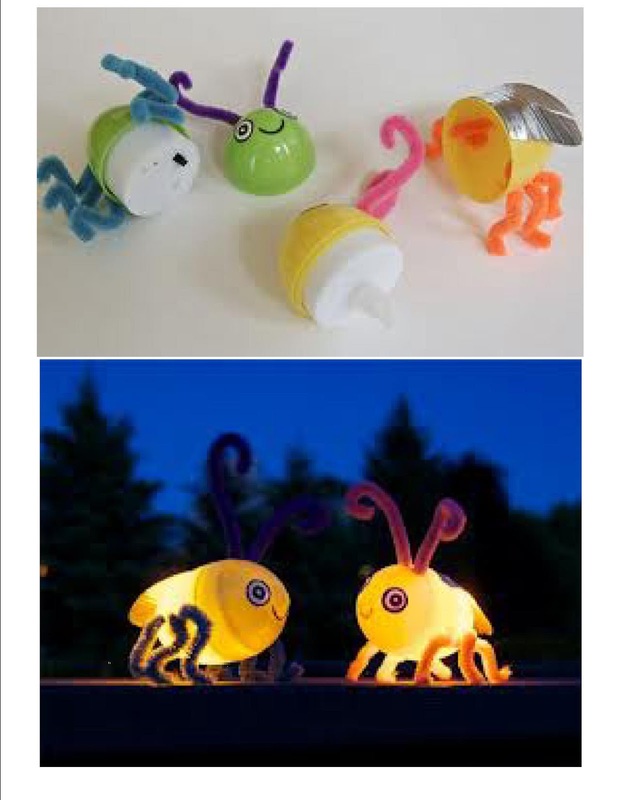 Poke holes through the egg with a thumbtack to insert pipe cleaners to create two antenae. Eyes can be directly drawn on the egg with permanent marker or onto white dot labels and stuck to the egg. Wings can be made with any color duct tape.